Andréa Maria Cecil trolls Reebok HQ during the Northeast Regional, while Hilary Achauer soaks up the sun in SoCal. 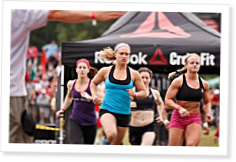 The 2011 Reebok CrossFit Games featured 17 regional competitions going on in very different areas. Up in Canada West, the athletes competed in a hockey rink. In Northern California, the athletes competed in the rain. They had a streaker at the Australia Regional. In the last weekend of regional competition, we sent Andréa Maria Cecil to the Northeast Regional at Reebok International world headquarters in Massachusetts and Hilary Achauer to Long Beach State in Southern California. Here’s what they saw on the same weekend in June, 2,600 miles apart. Tony Leyland examines what makes the ideal CrossFit athlete. Dave Castro, you are officially replaced from announcing all future CrossFit Games events. Travis Bagent is a beast! The Mikko of the MC game. He must do all future Games events. He did a great job at the Northeast Regional!! always makes me happy to see an arrested development reference... something more of which crossfit needs.